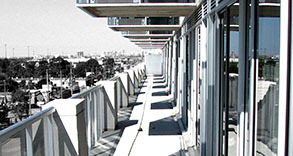 Among the projects that illustrate our company’s unique talent for reinvigorating old neighbourhoods with new urban life are Loggia on The Queensway, The Annex in mid-town Toronto, Liberty Walk in North York, and most recently, The Station at Wilson Avenue and The Allen Expressway. Where others saw problems, we saw possibilities. The result has been beautifully designed homes, in well-planned communities, at surprisingly affordable prices. With every community we build, we work to make home ownership more rewarding and economical for each of our homeowners. We see every new home community as an opportunity to create more than a tower or tract of homes. We recognize and embrace the fact that our neighbourhoods have a snowball effect on future homeowners’ lives, as the impetus for on-going growth in an area. We create plans that allow for the growth of our city and its communities. The key to our success is understanding how changing demographics and homeowner needs affect what we do, and responding accordingly. Brandy Lane prides itself in our cohesive and experienced management team, covering an array of disciplines. With this expertise, we’re able to approach every community we design and build with effective and efficient processes that have made our company a recognized industry leader. Our Board of Directors and ongoing strategic partnerships are also an important part of our innovation and strength.